A hit at Cinetopia 2014, “The Skeleton Twins” follows estranged twins Maggie (Kristen Wiig) and Milo (Bill Hader) as they feel they’re at the end of their ropes. But, when an unexpected reunion forces them to confront why their lives went so wrong, the twins reconnect, and realize the key to fixing their lives may just lie in repairing their relationship. I love this film! Besides being big fans of Bill Hader and Kristen Wiig, the film was the most enjoyable film I saw at Sundance this year. Christy Lemire of RogerEbert.com says, “As we enter this season of big, important awards contenders that ‘matter,’ ‘The Skeleton Twins’ is a small, intimate gem that might truly matter.” “The Skeleton Twins” opens Friday at the Michigan Theater. Betsy Sharkey, Los Angeles Times -- One of the better movies to come along this year. Stephen Holden, New York Times -- If countless movies about brothers and sisters reveal common family traits, "The Skeleton Twins" is subtler than most in evoking a mutual sympathy that might be called a cellular understanding. Joe Morgenstern, Wall Street Journal -- It plays to the antic gifts of its stars, two Saturday Night Live luminaries reunited in the roles of troubled twins reunited by near-tragedy, yet it also turns them loose to explore deeper regions of hurt and love. Michael O'Sullivan, Washington Post -- The actors have an obvious rapport. It's deep enough to evoke the ties, entanglements and bloodletting of a real kinship. But Wiig and Hader's instincts as entertainers are keen enough to know when to stop cutting. David Rooney, Hollywood Reporter -- Warm, funny, heartfelt and even uplifting, the film is led by revelatory performances from Bill Hader and Kristen Wiig, both of them exploring rewarding new dramatic range without neglecting their mad comedic skills. In “The Equalizer,” based on the Edward Woodward TV show of the same name, Denzel Washington plays McCall, a man who believes he has put his mysterious past behind him and dedicated himself to beginning a new, quiet life. But, when McCall meets Teri (Chloë Grace Moretz), a young girl under the control of ultra-violent Russian gangsters, he can't stand idly by - he has to help her. Armed with hidden skills that allow him to serve vengeance against anyone who would brutalize the helpless, McCall comes out of his self-imposed retirement and finds his desire for justice reawakened. If someone has a problem, if the odds are stacked against them, if they have nowhere else to turn, McCall will help. He is The Equalizer. Todd McCarthy of the Hollywood Reporter says the film is “the most exciting, violent and stylish film of its type in a very long while.” “The Equalizer” opens Friday. Joe McGovern, Entertainment Weekly -- One long and loathsome bore of a movie. Joe Neumaier, New York Daily News -- Washington, now 60, continues to push himself to new areas and fine-tune his charisma. He remains one of Hollywood's most effortless and engaging actors. Alan Scherstuhl, Village Voice -- It's great if that's what you're into, but is this the best use our culture has for a talent like Denzel Washington? The creators of "Coraline" and "ParaNorman" introduce audiences to a new breed of family – “The Boxtrolls,” a community of quirky, mischievous creatures who have lovingly raised an orphaned human boy named Eggs (voiced by Isaac Hempstead-Wright) in the amazing cavernous home they've built beneath the streets of Cheesebridge. When the town's villain, Archibald Snatcher (Academy Award winner Ben Kingsley), comes up with a plot to get rid of the Boxtrolls, Eggs decides to venture above ground, "into the light," where he meets and teams up with fabulously feisty Winnifred (Elle Fanning). Together, they devise a daring plan to save Eggs' family. “The Boxtrolls” opens Friday. Richard Corliss, TIME Magazine -- The Boxtrolls has its penny-dreadful moments, but it's mostly a larkish stroll through a cemetery where the monsters are the good guys. Peter Debruge, Variety -- Squanders Laika's considerable artistic talent on an unappealing concept and screenplay. Thursday, September 25 at 7:30 PM. Free admission. Presented by the UM Library, in conjunction with Sundance Film Forward. Featuring post-screening Q&A with director Marta Cunningham. The film explores the complex issues raised by the shooting of an out, bi-racial transgender teen (Larry King) by an 8th grade classmate (Brandon McInerney). With keen insight, the film connects the human wreckage of Larry’s and Brandon’s troubled lives – both bullied and both searching for a sense of belonging. You don’t have to be familiar with the murder of Larry Latisha King to know the story: a person who is perceived to be drastically different and a societal ill is murdered by someone in their community. We all know a story like this: Matthew Shepherd, Trayvon Martin, James Craig Anderson, etc. When I asked Valentine Road director Marta Cunningham why she chose to tell the Oxnard, Calif. story she said she became angry that no one cared about this kid who did nothing but try to express himself. To start the film, she asked us to recall what it was like to be an eighth grader. I was reciting Animaniacs lines, making origami out of notes passed between my friends, balling all of my confused love feelings for anyone attractive into 1-page poems. Even though I faced death close to home in my family, I was worried about catching cancer from chewing gum and ducking under windows on New Year’s Eve while watching A Christmas Story with my dad and siblings. I wasn’t worried about being shot by a classmate. In “National Theatre Live: Euripides’ Medea” Helen McCrory (“The Last of the Haussmans”) returns to the National Theatre to take the title role in Euripides’ powerful tragedy. For the sake of her husband, Jason, Medea has left her home and borne two sons in exile. But, when Jasonabandons his family for a new life, Medea faces banishment and separation from her children. Cornered, she begs for one day’s grace. It’s time enough. She exacts an appalling revenge and destroys everything she holds dear. “National Theatre Live: Euripides’ Medea” plays Sunday, September 28 at 7 PM at the Michigan Theater. Presented in partnership with UMS. One of Poland’s most important novelists, Tadeusz Konwicki, was also a director and screenwriter. “Jump” (“Salto”) is his tantalizing existential mystery that hops nimbly between allegory and black comedy. It begins with the hero jumping off a moving train and making his way to a small town where he lived during the war. Or did he? Riffing on his “Ashes and Diamonds” persona, Zbigniew Cybulski delivers a dazzlingly protean performance. Is his character an imposter, a fugitive, a prophet, an avenger, a ghost, or just an ordinary schmuck? “Jump” (“Salto”) continues the Martin Scorsese Presents: Masterpieces of Polish Cinema series and plays Monday, September 29 at 7 PM at the Michigan Theater. “Young Detective Dee” tells the captivating tale of Dee Renjie’s beginnings in the Imperial police force. His very first case, investigating reports of a sea monster terrorizing the town, reveals a sinister conspiracy of treachery and betrayal, leading to the highest reaches of the Imperial family. “Young Detective Dee” plays Wednesday, October 1 at 7 PM at the Michigan Theater. FREE admission! Part of Electric Shadows: Premiere Contemporary Chinese Film Series presented by the UM Confucius Institute. 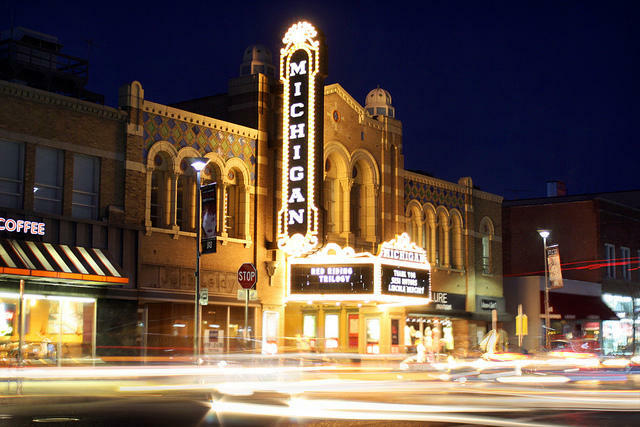 The Manhattan Short Film Festival returns to Ann Arbor! This extraordinary global event brings together over 100,000 people in over 300 cities across six continents, in cinemas, galleries, universities, museums and cafes, during the week of Sept. 28 - Oct. 7 for one purpose: to view and vote on the Finalists’ Films in the Annual Manhattan Short Film Festival. Upon entry at all participating venues, festival attendees are handed a voting card and an official program and asked to vote for the ONE Film they feel should win. Votes are tallied by each host venue then emailed to the festival’s NYC headquarters. The Manhattan Short Film Festival plays Thursday, October 2 at 7:30 PM at the Michigan Theater.